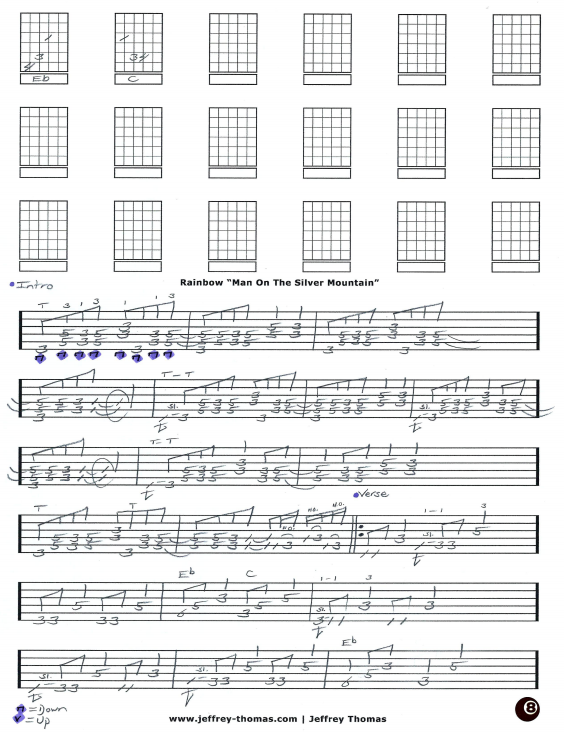 Rainbow Man On The Silver Mountain Free Guitar Tab by Jeffrey Thomas. Learn this classic by Deep Purple’s Ritchie Blackmore. I have the complete song structure, chords, fills and solo for you to learn. Want the full guitar tab for free? Send me your email address through the form provided and I will get it to you. Interested in learning more about Ritchie Blackmore’s guitar style? Fill out the Schedule A Free Lesson form and we can set up your free Skype guitar lesson. “Man On The Silver Mountain” was written by Ritchie Blackmore and Ronnie James Dio the song title is written on Dio’s grave. Find more popular online guitar tabs on my blog, tab and video pages.